From the outside, it's just another Mobil station on Route 28: a brick building squatting on asphalt with a quartet of gasoline islands out front. Inside is another story. Where shelves of chips and candy bars might have been, customers lean against narrow granite counters, holding scratch tickets by the handful, or lounge at one of the high-topped round tables, filling out blank Keno slips. There is no music, just the unceasing patter of five Lottery machines printing Mass Cash and MegaBucks tickets. Six monitors flash the latest Keno numbers, which smokers can also catch on a monitor protected by plexiglass while they lounge at picnic tables on a blacktopped patio out back. Ted's Stateline Mobil is the King Kong of Massachusetts Lottery agents. The store sold $12.6 million worth of lottery tickets in 2007, millions more than any of the other 7,500 or so bars, restaurants, and convenience stores that sell lottery tickets in the state. Owner Ted Amico earned a staggering $625,000 on the standard 5 percent commission lottery agents receive for all lottery ticket sales, not including a 1 percent commission on all his customers' winnings. The average store owner made about $37,000. Ted's rules the lottery world partly because it has famously sold an uncanny num ber of jackpot-winning tickets over the years, including a $17 million prize in 1988 that was then the largest in state history. There is also another reason: The New Hampshire border runs through the parking lot. Just as Massachusetts residents head to New Hampshire for tax-free beer and cigarettes, Granite Staters drive south of the border for lottery tickets - especially scratch tickets. "I won't waste my money in New Hampshire," said Christine Tangusso, a 37-year-old computer consultant from Salem who stopped by Ted's earlier last week. Compared with scratch tickets in other neighboring states, the top prizes offered on Massachusetts scratch ticket are bigger, and the odds of winning are often better. That's because the pool of money at stake is bigger in Massachusetts, and the Bay State sends more of its lottery income back to players in prizes, a strategy that lures core players back for more every day. 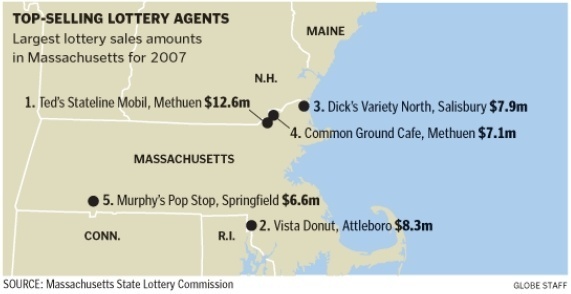 All of this has meant big profits for stores on the borders - the top five lottery agents in Massachusetts are on the New Hampshire, Rhode Island, or Connecticut borders. At M&N Border Store, just across Route 28 from Ted's, on the New Hampshire side, owner Bob Patel said he sold a mere $100,000 worth of New Hampshire lottery tickets last year. "Why would you buy a scratch ticket there if you know anything about scratch tickets?" said Tony Amico, who now runs Ted's for his older brother, who retired a decade ago and spends his winters playing golf in Florida. "Why would you buy a ticket there if you want to win a $1 million prize?" Norm Cooper, a kindly, red-faced 62-year-old candy maker from Salem, N.H., stops by Ted's "almost every other day" on his way home from work and drops $110 on scratch tickets. He won $5,000 two months ago, and scratched his way to $1,000 earlier this month. Cooper points out that the top prize on a $20 scratch ticket in Massachusetts is $10 million, compared with a piddling $250,000 in New Hampshire. He knows he's more likely to win the top prize in New Hampshire - there are fewer players. But he'd rather have a chance at the $10 million. And he comes to Ted's religiously because it's "a lucky station." This does not necessarily improve Cooper's 1-in-6.55 million odds of winning $10 million on the Billion Dollar Blockbuster. But logic is not the name of the game. Cooper said he rarely buys milk or bread at Ted's. "I know I'm paying for the convenience," he said. "I'd rather save the dollar." Ted's was an unremarkable auto service station in the late 1970s when Ted Amico, who had worked as a sales representative for Mobil, decided to buy it. He didn't have the cash. Hardly born to money, he had grown up in a Lynn three-decker, the son of a shoe factory worker who tended bar at night - so he borrowed it. His younger brother doubted the wisdom of this. "My brother knows nothing about cars," he said with a laugh. "He couldn't disconnect a battery if you paid him." As it turned out, that didn't really matter. The station acquired a Massachusetts Lottery machine. A few years later, in 1988, the station sold a $17 million ticket to a Methuen grandmother, a prize so inconceivably mastodonic at the time it attracted huge media attention. Crowds of customers began arriving, convinced lightning could strike twice. It did. In 1996, Ted's sold a $35 million jackpot ticket. The next year, there was a $42 million payout, another record. Two $4 million winners bought their tickets at Ted's in 2001 to 2002, not to mention a gallery of lesser prizewinners who took home enough to buy a nice Mercedes or three. Just the week before last, somebody won $1 million on a $20 scratch ticket from Ted's, Amico said proudly. "They seem to have the luck of the Irish here, that's for sure," said Steve Zis, a 47-year-old self-employed auto salesman from Pelham, N.H., who stopped in for $100 in scratch tickets Thursday. Some of the winners never return. Others come back to tip the counter help or else to have their picture taken for the wall. A guy who got $175,000, Amico said with a grin, "still comes in the store, bragging about how he won." Big jackpot drawings have made for some crazy times at Ted's. On at least one occasion, police details could not prevent a traffic jam on Route 28. Manager Phil Bosch recalls another evening when his lottery machines refused to print more tickets. Frantic, he called the Lottery headquarters, where someone eventually remembered that the machines had been set to max out at 10,000 tickets. It had never happened before, Bosch said. But Amico and Bosch try to keep lines from forming, and to keep their customers comfortable. Fifteen to 20 employees run as many as five registers, and a pair of scratch ticket vending machines stand sentry near each door. A cooler was moved to make more space for Keno players. Amico has been searching on the Internet for an awning to protect the smokers from the rain. "That's in the works," he said. As for Amico, he said he does not play the lottery much. When he was a bartender, he said, he didn't drink, either. "Once in a while, when the jackpot's really big, I buy a ticket like everybody else," he said. "That's it."